Meanwhile, in small bowl, mix Topping ingredients with fork or hands until crumbly. Set aside. Separate dough into 8 rolls. Flatten each into 4-inch round; place in muffin cup. Divide Apple Filling evenly onto rolls in muffin cups. Divide Topping evenly over Filling. Bake 10 to 12 minutes or until bubbly and tops are lightly browned. Cool slightly before removing from muffin cups. Cool completely, about 30 minutes. Serve cupcakes topped with whipped cream and a drizzle of syrup. 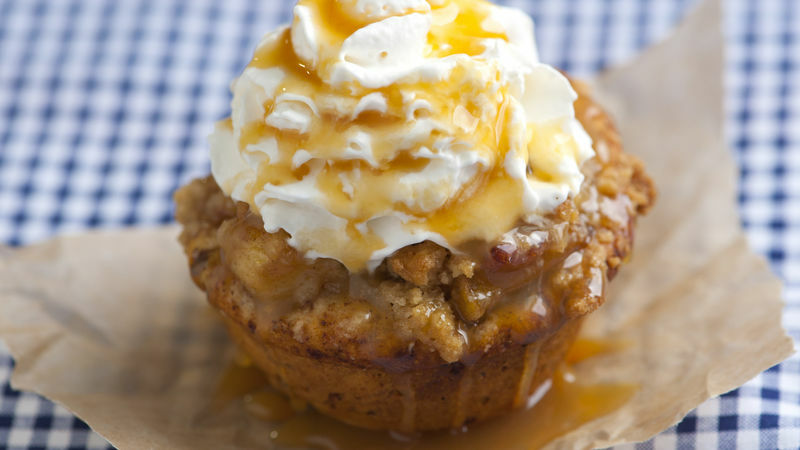 Take a shortcut and use canned apple pie filling. Instead of whipped cream, top with ice cream or your favourite flavour of buttercream frosting.